Painting subjects that are familiar during a certain season of the year is great fun! 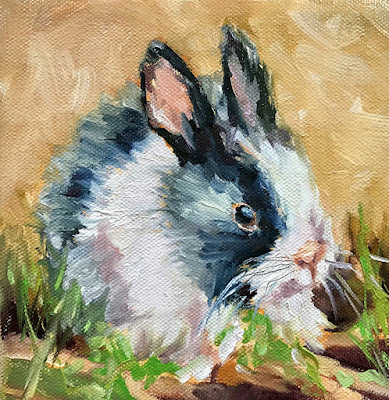 Put one of these small animal oil paintings near a favorite spot in your home to brighten your decor and your spirits! Visit http://deannajaugstetter.com to view more of my work. 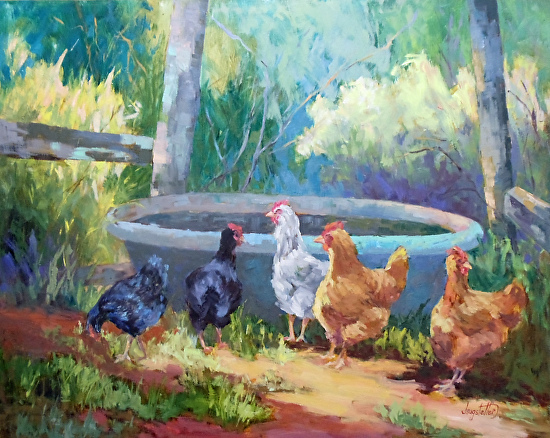 A Day At The Pool" is a landscape and domestic animal painting inspired by my photo session in the mountains of Western North Carolina. Where else would you find an old iron tub out back where the chickens roost! Rural scenes such as this always make me smile! A familiar scene in Paris is one of the many beautiful bridges that cross the Seine River. There is a beautiful view of wonderful architecture, boats coming and going, and the people of Paris from each bridge. My cat, Dolly, was in bad need of attention! She jumped up on the bed where I had laid out my fabric for cutting and refused to budge! I chuckled as I continued to plan my sewing project. 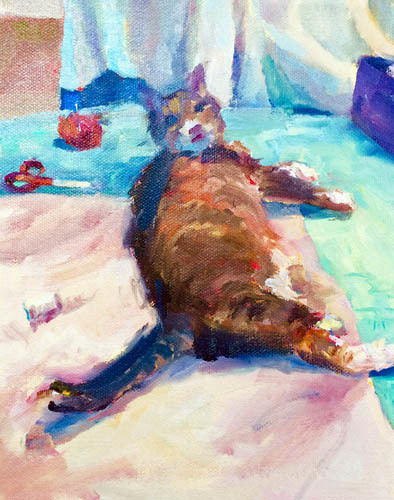 "Attention Needed" is a feline oil painting on stretched canvas. 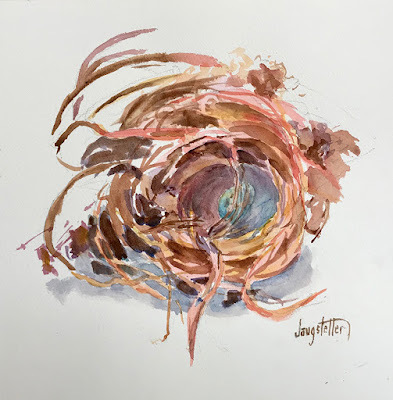 Please contact me on my home page for more information on this painting! This painting was a recent commission. If you'd like to commission a painting, please feel free to contact me. The Eiffel Tower is a beautiful, internationally recognized architectural wonder! I have visited the grounds, and have had dinner up top at the restaurant. 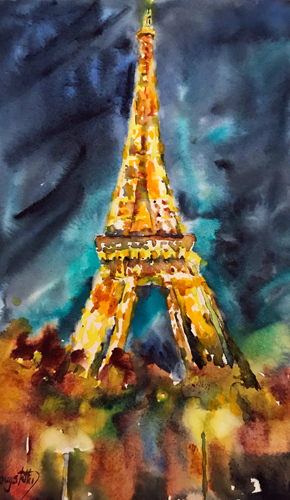 Painting the Eiffel brings memories of a city many fall in love with. Labels: Eiffel Tower Painting, French Architecture, Original Watercolor Painting. Georgia Artist. Deanna Jaugstetter, Paris "Admiring the Eiffel"
I never tire of painting the Eiffel Tower. The image of this architectural wonder is locked in my memories of the beautiful city of Paris, France. 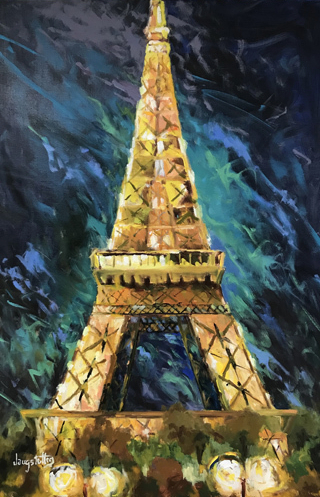 "Eiffel II", an oil Parisian landscape is my impression of the tower on a clear night in August. Looking out over the city of Paris from the top of the Eiffel is another experience I won't forget. Bruges Canal III is inspired by recent photos taken in this beautiful city of Bruges, Belgium! 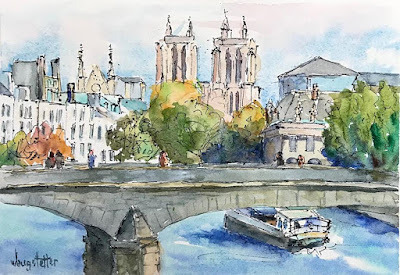 While visiting Lille, France we always drive to the city of Bruges which is a short distance by car from the city of Lille, France. 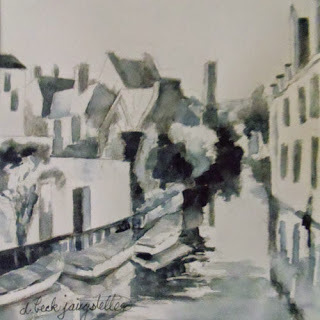 It is a beautiful city with medieval overtones where canals linked the city to the sea. 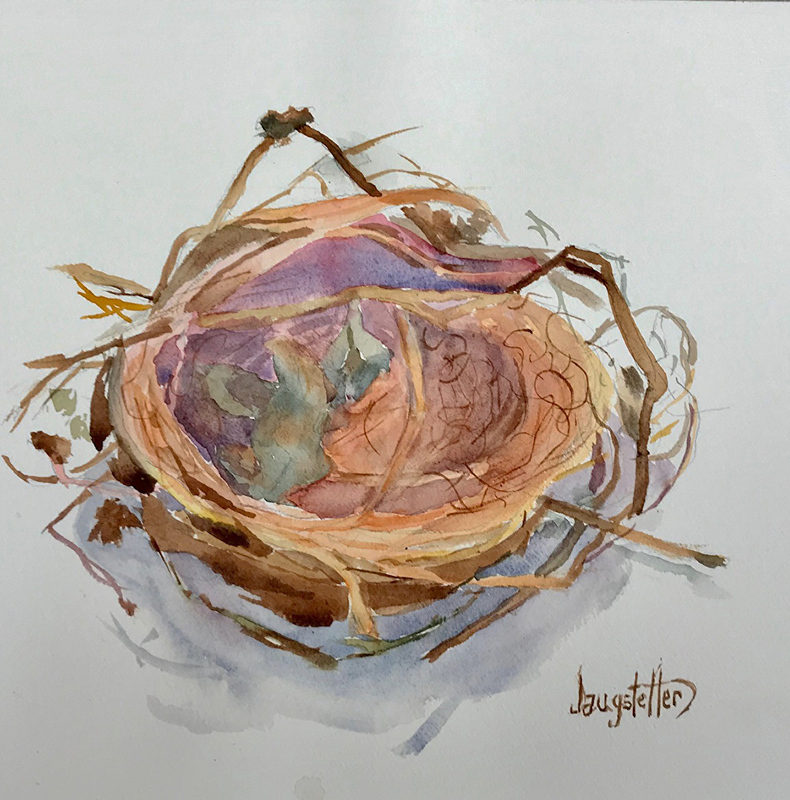 This still life painting done with graphite, pen, and watercolor. The painting is custom double matted with high quality white archival mat board , backed with foam core, and ready for framing. 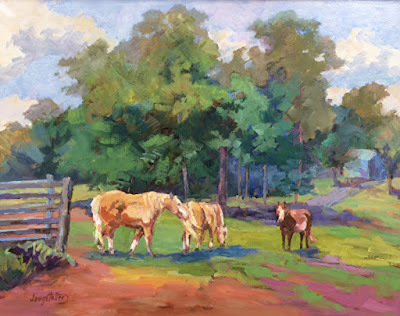 The tonal quality of the painting makes it an excellent choice for any interior! A grouping of these small mixed media subject make an impressive display ! $70.00/ Click HERE to purchase. Fort Screven" is a coastal site in the Savannah Beach area in Georgia. I recently visited this area and was intrigued with the small cottages nestled in the sandy soil here! 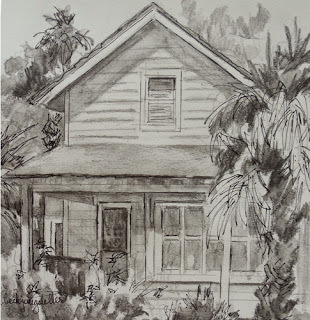 As soon as I returned to my studio, I began working on my sketches, describing what I had seen and enjoyed! 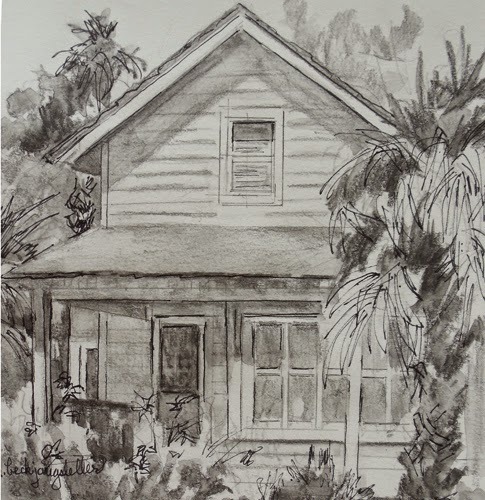 "Fort Scriven Cottage" is a 6 x 6, architectural/seascape pencil and ink drawing on paper. 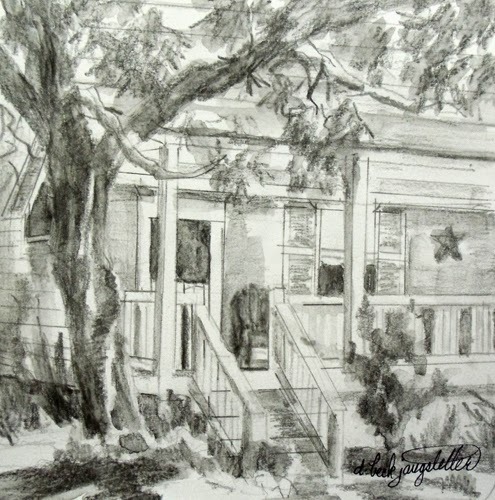 Original black and white drawings make a wonderful addition to your art collection! Be ready to enjoy more such small maritime studies/sketches on this site!Double matted with a soft white mat. 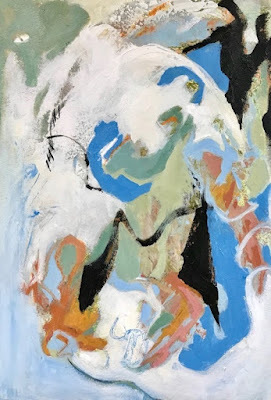 I enjoy the creative process of abstract art for the sudden unexpected happenings that occur beneath the layers of paint. 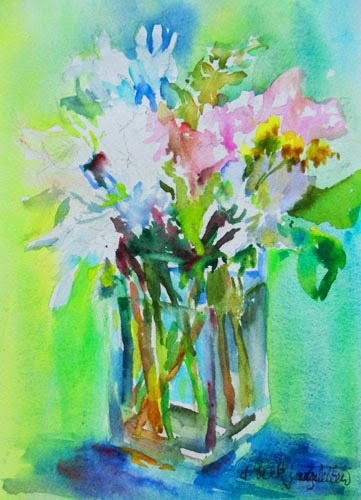 When studying this painting one feels the happy mood it conveys! I love the punch of black! 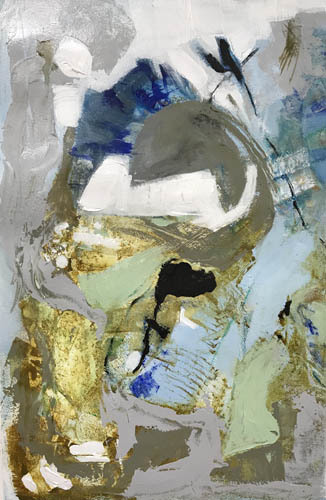 This painting is custom framed and matted in a gold contemporary frame. The Eiffel Tower's light casts a warm glow over the city of Paris! One never tires of this spectacular architectural landmark that charms all who visit the magnificent city! Notre Dame is one of the most recognized structures in Europe. It took 10 years to complete this magnificent cathedral! Inside Notre Dame Cathedral is a replica of the project which I enjoyed seeing. 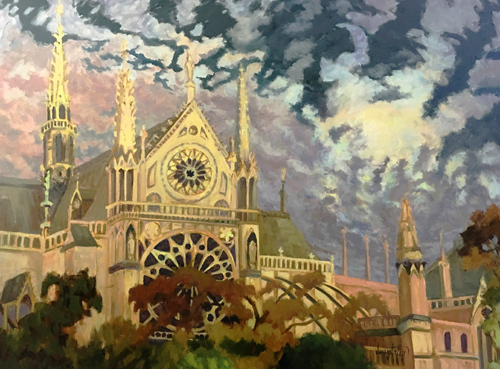 "Beautiful Basilica", an oil landscape painting is inspired by my impression of the night sky over Notre Dame while on a cruise down the River Seine. 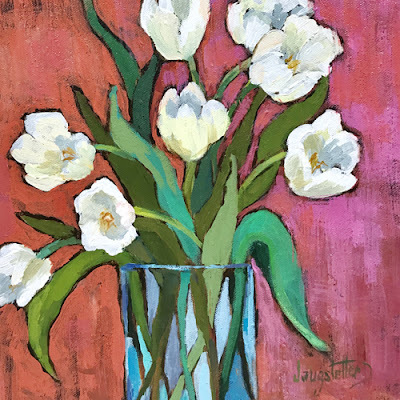 Click HERE for more information on this painting. While sight seeing in Paris I came upon this celebration and was taken by the flags and beautiful architecture of the stately buildings which are all over Paris. 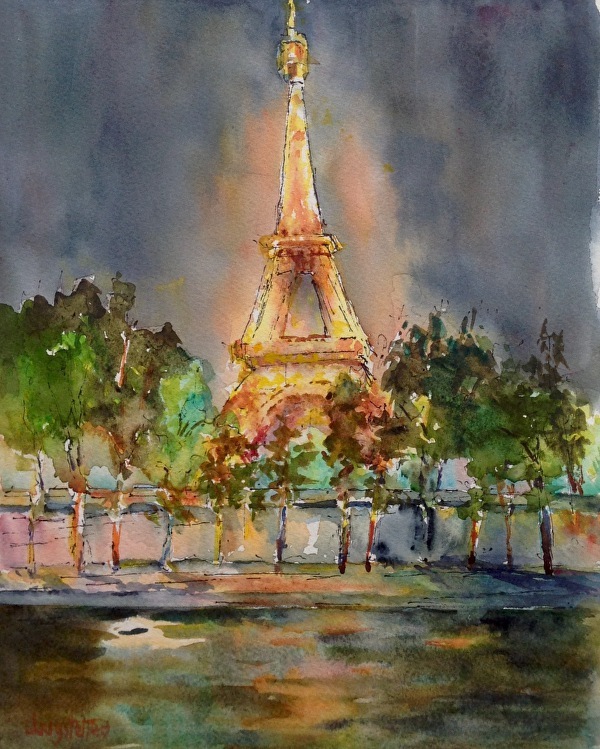 "Parisian Celebration" is a combination of ink and watercolor, a landscape painting, on archival paper. Walking through the gardens of "Giverny" where Claude Monet lived and painted was a magical experience! 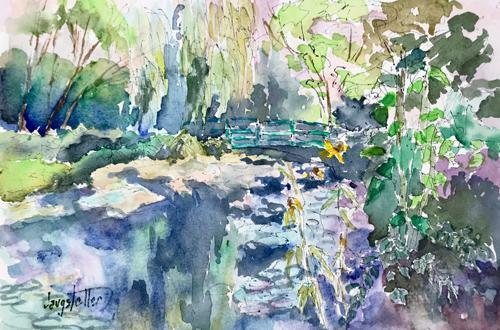 Monet stood "en plein air" and painted the water lilies and flora all the days of his life here. "A Moment With Monet", a watercolor and ink painting, is my way of creating a memory of being in the garden of such a masterful French painter. 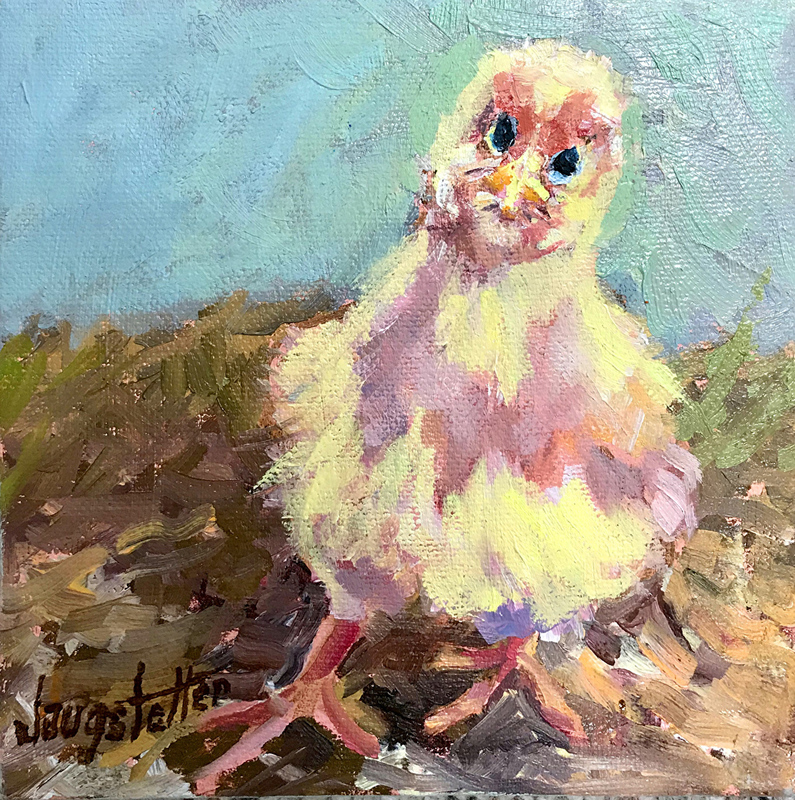 "Struttin Around The Hen House" is an oil painting inspired by my photographs of the chicken coup in an area where my daughter lives. The chickens have been built a great looking hen house to live in! 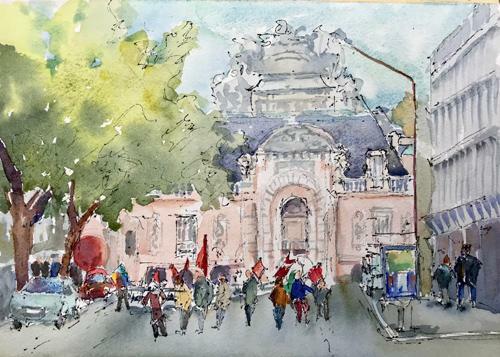 You can see their coup in the watercolor painting titled "Busy Bodies" on this site. The oil painting is painted around the gallery wrapped sides so it isn't necessary to add a frame. 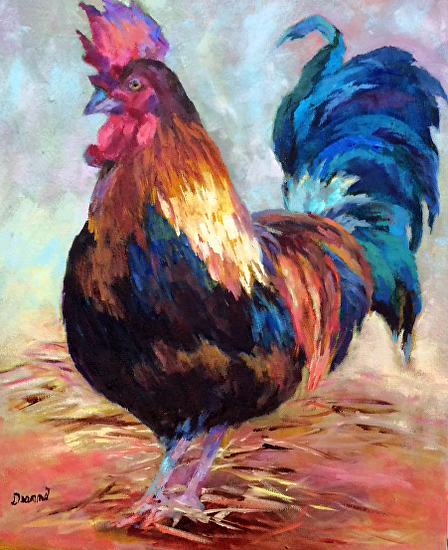 Deanna's Custom Designed frames are available for purchase if you wish to add a beautiful frame to the painting! Three's Company", a farm oil landscape painting is inspired by a visit to a barbecue spot located in rural Georgia. One never knows where and when the inspiration for a painting will occur! Cows are so interesting and it's just too bad that they can't talk! I'll bet they could tell us a thing or two! Growing up we had a milk cow named Butterball who would sometimes get a little testy when my Mom milked her! We named her Butterball appropriately because her milk eventually became butter from Mom's old timey churn. I still have the churn! I must admit when I went near Butterball, I was intimidated! 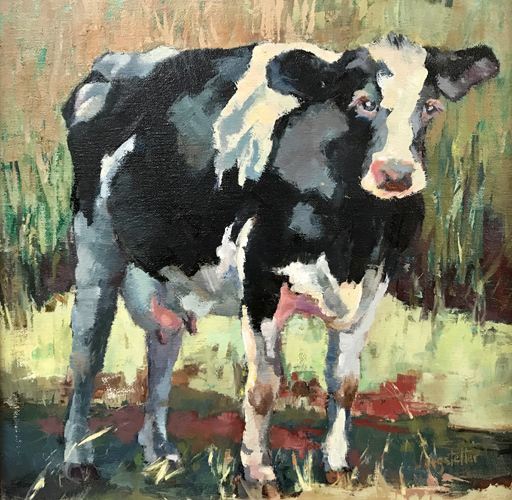 My bovine oil painting titled "Butterball"of this assertive cow in the North Carolina landscape gave me an opportunity to reminisce about days gone by as I worked on the painting! Tulip flowers lean and curve in all directions. It is this movement in the vase that results in an on going dance in the vase after arranging them. "Dance of the Tulips",an acrylic floral still life painting of white tulips, inspired by this unique flower dance. Peonies are said to mean good fortune, prosperity, and compassion! They are exquisite flowers! A friend allowed me to cut the last bloomers on her peony bush this spring! "Good Fortune, an oil floral still life painting, is inspired by the soft spiraling pink petals of these blossoms! Orchids are an exotic flower plant and bit finicky to keep for an extended period of time. 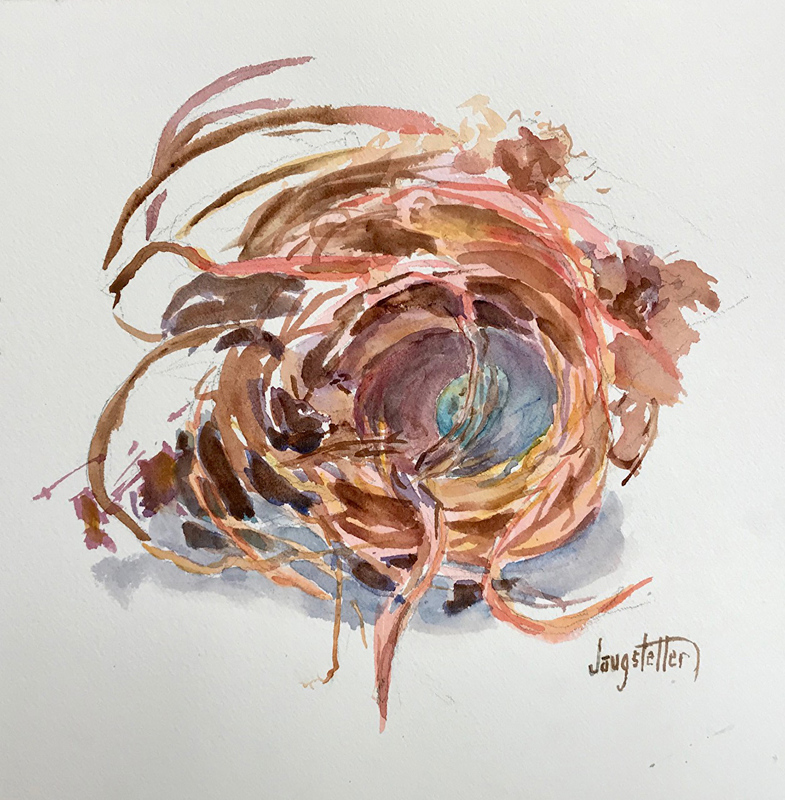 A painting of an orchid done from a still life in my studio lasts forever! 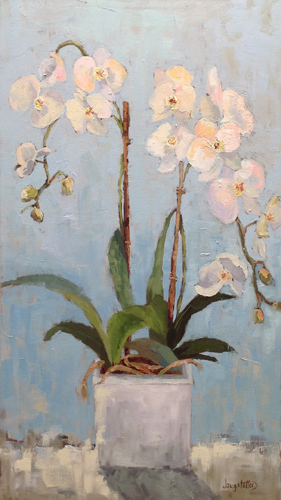 "Exotic", a floral-still life of a white orchids, is painted with brush and palette knife for added texture. A vase of roses of one color are lovely but a kaleidoscope of roses of beautiful colors is amazing! 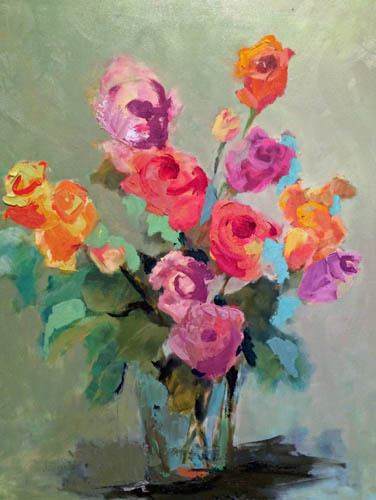 "Kaleidoscope VII" is an oil still life painting inspired by a collection of roses sent to me by my daughter. It is always so nice to have fresh flowers for my studio still life set up! 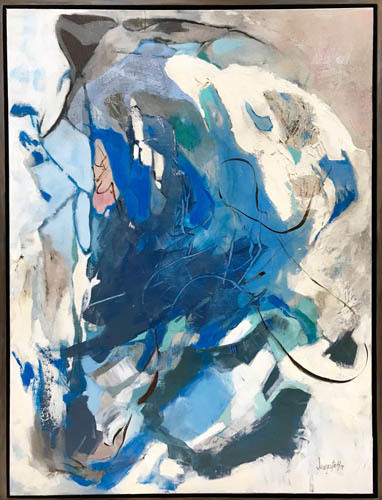 No frame is needed for this painting as the canvas is gallery wrapped around the sides and the sides are painted as well. 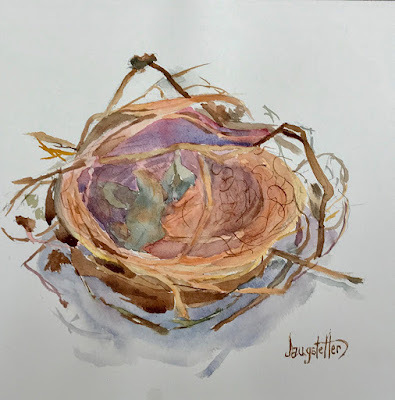 While working in my studio this winter of 2015, I just needed some sunshine! I drove to the nearest florist/ food market and found this bouquet of mixed flowers which were the perfect antidote for another gray day!!! 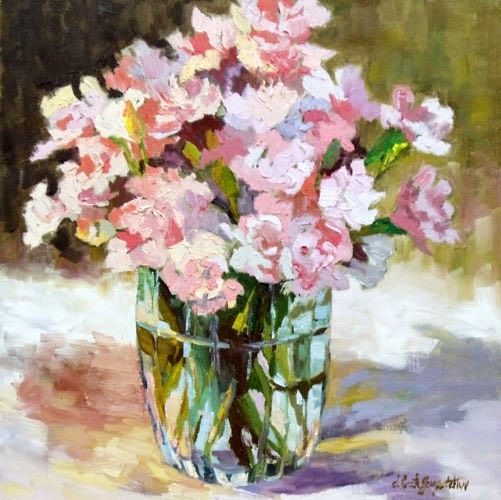 "A Bit of Sunshine" is a floral still life oil painting that is good for the soul! 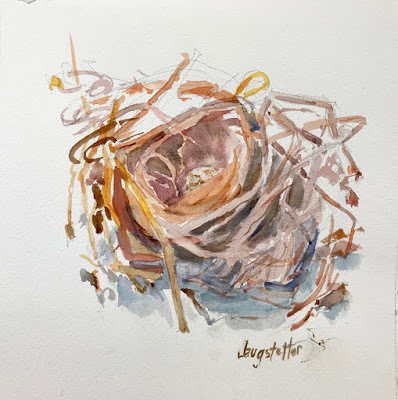 The painting is archival matted in a double white mat and custom framed. 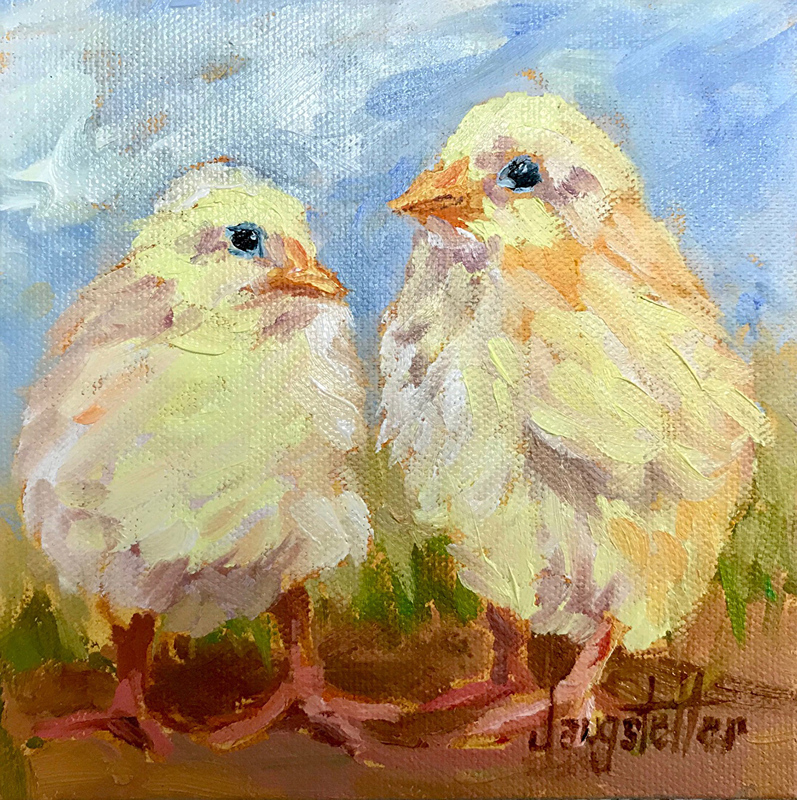 Contact me for shipping charges and "A Little Bit of Sunshine" will be on it's way to you!! Marty Robbins had a huge hit song in 1957 titled "A White Sport Coat". The popular hit record came to mind while I was painting these lovely little carnations! Marty sang about a white sport coat and a pink carnation; I am humming this song in my mind as I write! 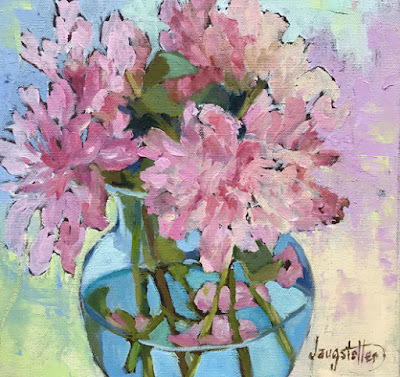 "Pink Carnation" is an oil floral still life painting done from life in my studio. Having always been one of my favorite flowers, don't you agree that these compact bloomers smell just so sweet!!! View my work on the sites below.